Happy New Year to all those of you who are, like me, still using and enjoying Traffic X. All of Mine are in a box in the loft with the boxed version of traffic. post in the interest of traffic as there no one home in the traffic office. That's you, me and a few others who have been posting here from time to time! I'm opening Traffic X on virtually a daily basis at the moment as I am 'improving' a whole batch of Caribbean island's airports using ADE and setting up appropriate AI traffic for them all. Traffic X is well suited for this. May the new year bring you many happy flying hours. Happy New Year, everybody. It's great to hear from you. Yes, I'm still enjoying Traffic X. As usual, nearly all aircraft that I use for AI are full-blown user models. These days, I'm dual-booting Windows 7 and Linux. In addition to running FSX on Windows 7, I'm now running X-Plane 11 on both Windows 7 and Linux. I haven't added an AI traffic program to X-Plane 11, yet. As is the case with FSX AI traffic programs, the AI aircraft models that the X-Plane 11 traffic programs use aren't all that great. Somebody should release AI traffic programs for multiple flight simulators with the traffic program for each simulator, itself, having multiple versions--one with low poly count AI aircraft and one with high poly count AI aircraft. Yep, I started with "Traffic", then "Traffic 2005", and then "Traffic X". They've all done me very well as I was able to import/use the previous version's schedules as each new program came along (something one unfortunately could not do with Traffic 360, which is hence the reason why I never upgraded to that). I am also opening Traffic X quite a lot. Flight plans and schedules are constantly getting added, amended, and deleted in line with airline news and changes in my local region, and around the world (although I work more on the local region changes than I do on International changes). As part of this work, thanks to the repaint program in the package, the liveries on my AI planes are as up to date as I can keep them. Not to mention the program's ability to allow me to add new aircraft which also helps to keep the program as current as I can possibly keep it. It can be time consuming work, but it is very rewarding and satisfying to know that when I am in the sim, the relevant aircraft, old or new, and all with the correct/current liveries, are flying to the applicable relevant airports just as they would actually be doing in real life. Traffic X, despite its issues and quirks, has been, and continues to be, a handy companion along the way. Throw in updating airports with ADE, and everything is pretty well as accurate as one can get it and keep it. I did a lot of work on FSX during 2018. I added TaxiSigns HD to all airports, and I added Airport Wizard taxiway lights to over 4,600 FSX airports. I added the taxiway lights on a per-airport basis, choosing the type of taxiway lights for each airport. That was a major project. Yep, I am using Traffic X, still with FSX, and still in Windows 7. I've seen screenshots and videos of how good P3D can be with it's shadows and all the fixes it offers … but my FSX is still going strong, looks great, is smooth, works, and doesn't crash (no pun intended). And that's even with all my ORBX sceneries, addons, and "high-end" user aircraft from PMDG, Majestic, Aerosoft, A2A, Flight1 and others. Besides, I can't bear to think about how much work I'd need to do to bring a newly installed sim such as P3D up to the standard that I have in place now with my FSX and its addons, scenery, user aircraft, AI, updated airports (ADE), etc etc. My FSX has been built-up over time and is, frankly, fantastic. To start over just sounds all too hard and not a lot of fun. And, XPlane is not for me; there's just not enough support for addons etc. Now … Dan … you've yet again piqued my curiosity. "TaxiSigns HD"? "Airport Wizard taxiway lights"? What are these things? That taxi sign and those tawiway lights in your screenshot both look damn good. Google sends me to FlightSimTools.com. Wow, these do indeed look good. How come I never knew about these? OK, it looks like I need to get these. I can feel more work coming on, in addition to all the Traffic X work. Hehe. Those taxiway lights provide a bit of glow on the pavement, too. Look closely at the following screenshot. (Incidentally, the jetways and ground equipment are my selections from REX Worldwide Airports HD). Both P3D and X-Plane 11 are great simulators, too, no doubt. Part of the reason I added Linux and X-Plane was to enable me to run a flight simulator under a non-Microsoft operating system. Since one of my brothers flew to Riga, Latvia aboard Aeroflot, earlier this week, I added the Riga Airport and an Aeroflot 737 livery to X-Plane 11. (Yes, Aeroflot flies 737s, too). 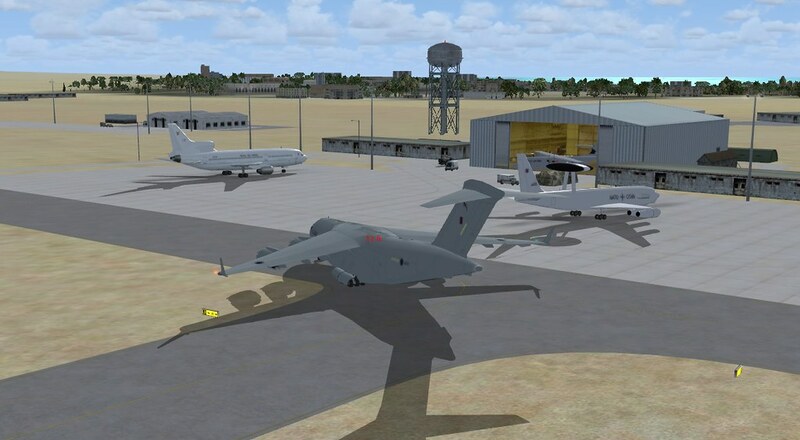 As you can see in the screenshot, below, good scenery shadowing is available in X-Plane 11 (providing scenery shadows are turned on in the graphics settings). Again, great to hear from you, freddy! Yes, I had already noticed that the taxiway lights illuminated the ground when I went to the product web page and also did some Google searches for reviews. It's subtle, but it's there. I have already purchased and installed TaxiSigns HD. What a fantastic difference it makes for such a simple thing. With one quick install, all your airports are instantly transformed. It's fantastic. How I had never seen nor heard of this before, I have no idea. I don't think I'll get the Airport Wizard. I've never been a fan of having my sim set with some airports looking different from other airports ... which would be the case if I were to tweak some of my local airports with it, but not do every other airport in the sim. It's the same reason why I don't purchase third-party airports; preferring instead to merely tweak airports in ADE. I just like all the airports in my sim all have the same look and feel, no matter where in the world I fly. That said, Airport Wizard does look easy to use, and I really do like the idea of having lit up aprons and proper looking taxi lights. I will admit my arm is a slight bit twisted (not much, but a little). I may just succumb later on and get it. Time will tell. Yes, it is good to hear from you too, and to once again see some activity in the Traffic X forum, albeit small. I knew if I posted something, it would possibly reveal the old forum's still got a faint pulse. I was concerned with consistency of appearance, too. That's why I actually ended up adding Airport Wizard taxiway lights to all FSX airports that had lighted runways. (The only exceptions were custom airports that already provided realistic taxiway lights). I knew if I posted something, it would possibly reveal the old forum's still got a faint pulse. Judging from the number of people who have already viewed your posting, I'd say it's more than a faint pulse. I do wish the Just Flight forum included a general software forum similar to the general forum that is provided for discussing hardware. Just Flight makes it easy to purchase software from many different developers through Just Flight. Perhaps a general software forum would increase their sales. What do you think? I also wish more forum participants would post descriptions and screenshots of how they are modifying their own sims. There's always something new to learn, isn't there? But how, prey tell, do you know which airports have lighted taxiways? Is there some kind of report you can export from the sim which tells you this? I think people have set a monitor on the forum. Any post in it, and they get an alert; thus checking it to see what the story is. I agree that Just Flight needs to have a "General" forum. As for increased sales, yes, a General forum might help in that regard. I get the feeling that Just Flight are a smallish company, so running and maintaining these things can be difficult with all the other things that might be going on for them. Yes, I think more screenshots would be good. But, in saying that, I am a hypocrite because I myself don't do it. That said, here are four images showing a few of the Traffic X aircraft that I have repainted. Most of the aircraft shown are Australian liveries. Qantas, Virgin Australia, Tiger, and Jetstar all changed their liveries since Traffic X was released. Rex (Regional Express) did not change theirs, but the livery was not represented in the default Traffic X. Same goes for the Singapore A380 in the first shot; it was not represented in the default Traffic X. A good observer who's familiar with Australian skies will notice a Tiger 737 in these repaints, as opposed to the usual A320s that Tiger is known for here in Aus. These screenshots only show a handful of the liveries I have repainted. I've done heaps! And that is just one way I modify my sim, to keep it current. If you're really good, you'll recognise the airport in these screenshots is Melbourne (YMML) and it has had extensive ADE work done by me (but, these shots are small so I wouldn't really expect anyone to notice). Repaints, airport work in ADE, adding new aircraft (the 787, including worldwide schedules, is a prime example), etc etc. I love doing this stuff. So much so that sometimes there's just no time to actually fly. I am sure many of us can relate. I used Airport Wizard as a guide. Within Airport Wizard, taxiways would be displayed if taxiways were present at that airport in FSX. If an airport had no taxiways (and I found thousands of FSX airports that had no taxiways), then no taxiway lights could be applied in Airport Wizard. Taxiway lights can only be applied in Airport Wizard if the FSX airport has taxiway lights. Thanks a bunch for both describing and showing us some of your work! I admit that I am behind on both aircraft models and liveries, but I fly the entire planet rather than concentrating on a region. Nevertheless, your posting serves as both a reminder of what I haven't done and great example of what can be done by emphasizing a particular region! Ha. You mentioned Riga in an earlier post and sent screenshots. I've just realised that I literally flew over Riga today on my way from Kaunas International Airport (EYKA) in Lithuania to Tallinn Airport (EETN) in Estonia. In fact, Riga was a VOR (RIX) in my flight plan. Perhaps I should have turned 45 degrees and waved out the window to you!? I just happen to be in that part of the world at the moment (in the sim, that is). Whilst I do normally spend a damn lot of time flying in my local region, I sometimes do fly the world too. It just so happens that I am doing that right at this moment, and coincidentally in that part of the world. So, taxiway lights can only be applied in Airport Wizard if the FSX airport has taxiway lights? Hmmm. That's interesting. I can now see how you could indeed do all the airports in FSX with this tool. My arm twists a bit more. No problem on me doing those screenshots and description in my previous post. It was actually fun to "brag a little" for a change. Hehe, if people only knew just how much time and work I have spent in this sim doing repaints, flight plans, airport editing, and the like ... no number of screenshots and descriptions could ever do it justice. The amount of work I've done keeping this baby up to date is the number one reason why I am still with Traffic X, and still with FSX. I think Ray is similar to me ... he's always updating an airport or something. I am sure, Dan, you're also the same. Speaking of sharing one's work, and your mention that Just Flight might perhaps benefit from having a "General" forum ... do you remember back in the day how Just Flight had a web page where one could share flight plans and liveries with the community? That page is long gone now. It's a shame really, because I probably would have bothered to put my repaints up there for others to use. That said, I'd only do that if I could do it without needing to provide my contact details in case people needed support with the stuff. I do enough support in my 9 to 5 job, not to mention on this and a plethora of other forums. T360 still I my account not used now moved on TG installed. ... and how are you finding Traffic Global? Is it good/bad/indifferent? To add to this conversation, I have just started to add to my AI aircraft collection in my scheduling programs - Traffic X and AIFP. When Traffic 360 came out, I purchased it as 'an Update to Traffic X' as Just Flight advertised it. Only to find that it was actually a new separate program that was different enough from Traffic X that prevented easy transfer of data (schedules) from Traffic X to Traffic 360. As a result of this, I never tried to use T360. However, I have now decided that, as T360 has a large complement of AI aircraft, I am going to try transferring some or all of them back into my FSX/Traffic X installation. I have just transferred one example of a C-17 transport as a trial. It seems to have moved without having to do too much work. I have now got lots of work to do to transfer a whole load of these T360 aircraft over. Can someone advise me on how to post pictures in this forum? OK I may have found a way to post a photo? ... I've always wanted to add C-17s in to my Traffic X (not to mention also adding a plethora of other aircraft that I see Traffic 360 has, but which Traffic X does not). Having added the 787, I know what's involved to add the C-17. But, first, I need to find a C-17 model that already has liveries done for a range of various locations/countries in the world. Many of the Internet models do not come with a range of liveries; instead being one-offs. This results in one needing to do extra searching to find liveries, followed by some cfg editing, and then finally storing in to appropriately named sub-folders to create a "package". Whilst I could certainly do that, I just can't be bothered with the work required for all that. The 787 that I added already had all that work done for me; a good range liveries, appropriate cfg files, and packaged neatly enough that I didn't have to do much work. I am sure the C-17 model in Traffic 360 is already well covered by way of liveries and is already neatly packaged in it's own folder. But, I don't own Traffic 360, and therefore I don't have access to that model. If anybody out there wants to read that as a hint, then feel free to PM me. Your screenshot makes me jealous Ray. But good work, mate. Well done. How could my copy of 360 help you, remember I am not a computer expert, like you and RayM. Your offer is much appreciated. I've also received an offer from RayM. I've decided to take Ray up on his offer, but I thank you all the same. Yes, today's new fangled machines can be a pain. The trick for technology these days is to get a 15 year-old to help you. Although, that said, today's 15 year-olds probably know how to repair a tablet and a phone, as opposed to a PC. It seems you three are the only ones still using Traffic X.
I'm still using Windows 7, too--although there are more than three of us doing so. Since I am dual booting Windows 7 and Linux, I may continue to use Windows 7 past its official end-of-life date. I'll just stay offline with Windows 7 and use Linux for my online work. I have complete backups to an external hard drive to preserve everything. Just Flight should have made it easy to transfer work from earlier Just Flight traffic programs to their latest program. Who wants to lose years of configuration? Companies such as Microsoft, Just Flight, Google and others haven't gotten the message. I read yesterday that Google wants to create an interface that uses hand gestures. Can you imagine an office where half of the people are using hand gestures and half are talking to their computers? Just because something can be done doesn't mean that it should be done. What happened to that thing called "judgment"? Microsoft didn't use it with the Windows 8 and Windows 10 user interfaces. Now Google is demonstrating that they lack judgment, too. (At least neither Microsoft nor Google is as bad as the current President of the United States). It is very rare for a new computer operating system to be so earth-shatteringly better that virtually everyone is willing to abandon the old. That happened with the introduction of Windows 95, but companies are kidding themselves when they think their new product represents such a sea change. I'm perfectly willing the move to something new, but only when its features, functions and benefits are worth making the change.